(OPride)—Two days after U.S. Secretary of State Rex Tillerson called for greater freedom to address the ongoing political crisis in Ethiopia, soldiers shot and killed at least nine civilians and wounded more than a dozen others in an unprovoked attack in Moyale, southern Oromia, near the border with Kenya. 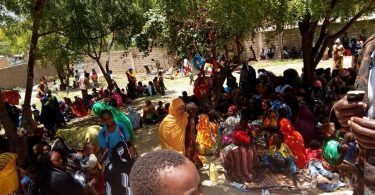 Hundreds of civilians running from gunfire have reportedly crossed into the Kenyan side of Moyale town and are in need of humanitarian assistance. Oromo activists put the death toll from Saturday’s mayhem as high as 15. It was not immediately clear what exactly triggered the latest mass killings. The mayor of Moyale, Aschalew Yohannes, told the state-run Oromia Broadcasting Network (OBN) the incident is under investigation. Director of the city’s main hospital told OBN that all the victims died from gunshot wounds. Eyewitnesses told the Voice of America (VOA), the attack came as a shock to Moyale residents as there were no protests, meetings, roadblockage or a disturbance that could have provoked the military onslaught. One eyewitness said some of the victims were shot at a coffee shop or while running away from the barrage of gunfire. 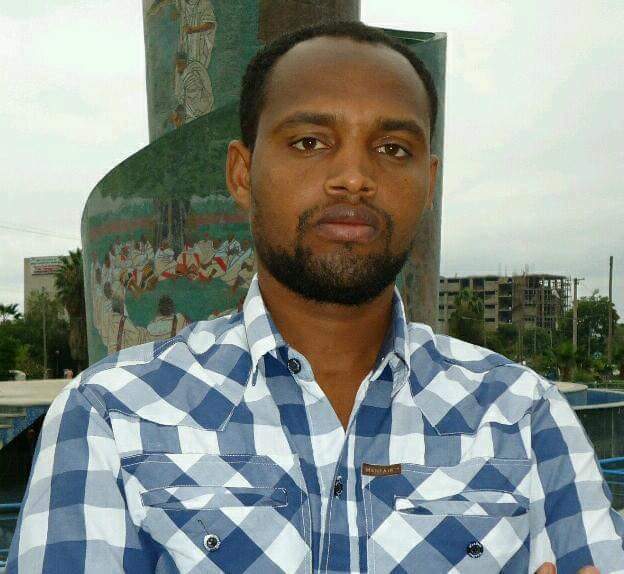 Daniel Berhane, a pro-government blogger in Addis Ababa, who has been actively promoting the emergency decree, has downplayed the brazen attack in Moyale as a mistake. “A military unit was dispatched to Moyale area to intercept an OLF unit sneaking into the country,” he wrote on Facebook, referring to the Oromo Liberation Front, a rebel group that Ethiopia considers a terrorist. Facebook and Twitter are awash with extremely graphic images of the casualties in Moyale. In one of the images, several dead bodies, wrapped in blood-drenched shawls, are lined up beside each other. Few of the bodies appear labeled. In one particularly disturbing image, the name “Tamam Nageso” was scribbled on the shawl in red ink. Activists have identified at least ten of the deceased, including Tamam, pictured here, who was described as a beloved principal at a local school. Those massacred are mostly young men and some seem to have taken bullet wounds to the abdomen area. Another image shows a group of concerned youth — with visible anguish and distress on their faces —as they stand over the bodies of their fellow townsmen. The death toll from the Saturday massacre in Moyale is expected to rise as five of the critically wounded victims have been referred to hospitals in the city of Hawassa, some 400 kilometers north. It is unclear if these patients would even be able to survive the trip. The Moyale massacre caps weeks of relentless violence against civilians across Oromia, which began when authorities declared a six-month state of emergency on February 16. On March 2, parliament approved the implementation of the nationwide decree in a rigged vote, which led to strikes and protests across Oromia. 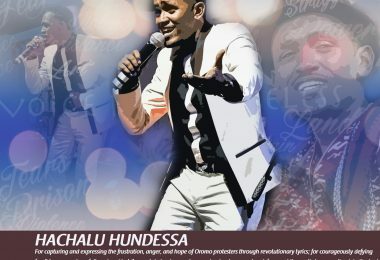 The parliamentary vote came two days after security forces were ordered to “take all the necessary measures” to clampdown on “spoilers of peace,” a reference to unarmed protesters and dissenters in the restive Oromia state, which has been the epicenter of resistance since 2014. So far, more than 30 civilians, including minors, have been killed by the military-run Command Post which oversees the emergency decree. More than 60 others have been wounded. 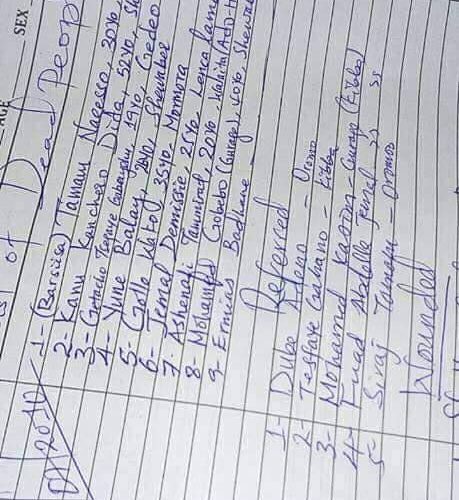 Dozens of people, including youth activists, mayors, Oromia police officers and the deputy commissioner of Oromia police, have been abducted and jailed at undisclosed detention centers. 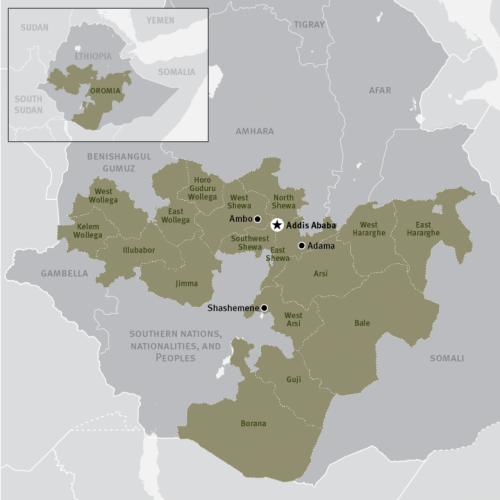 Until Saturday, killings took place mostly in western, central and eastern parts of Oromia, including the towns of Ginchi, Ambo, Guder, Nekemte, Dembi Dollo, Saqa Coqorsa and Chiro. These towns have seen much bloodshed and buried too many innocent civilians over the past few years. Ambo was the scene of an especially horrendous massacre caught on audio as security forces razed down nearly a dozen people last October. By all accounts, the state of emergency has failed to secure peace and guarantee public safety. In Oromia, a relative calm that preceded the decree, is now replaced by heightened tensions and daily reports of civilian casualties, almost all of them in their early 20s. The executive committee of the ruling coalition, the Ethiopian People’s Revolutionary Democratic Front (EPRDF), begins its much-anticipated gathering today. They have a full slate, including a crucial vacancy in the prime minister’s post that needs to be filled. Officials in Oromia continue to urge the public to express its grievances through a peaceful means. But the people’s patience is running out amid relentless official violence and the arrests and disappearances of local youth. In his statement Saturday, Addisu, the spokesperson, said the state government will redouble its efforts to make sure the ongoing threat to public safety is resolved in a sustainable way. That effort is likely to include a renewed push from the Oromo People’s Democratic Organization (OPDO), officially the ruling party in Oromia, for the election of their candidate, Dr. Abiy Ahmed, as the country’s next prime minister. 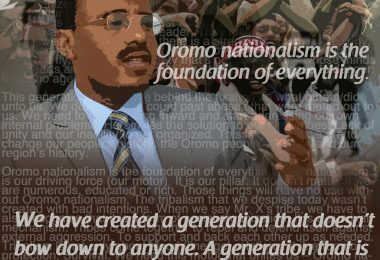 But activists and analysts say the most important agenda for the OPDO should be the immediate repeal of the martial law, which has effectively amounted to a declaration of war on Oromo civilians. One thing is clear: The Saturday massacre in Moyale is a reminder that the disputed emergency decree has become a security nightmare for the state and it doesn’t offer a sustainable path forward for the country. As I write this, the number of dead has climbed to 13 and over a dozen wounded. These are unarmed and not protesting at all. Tigray Front has issued a statement that these were killed by “mistake” (it was their mistake then to be killed?) This is the exact phrase used by Derg fascists. 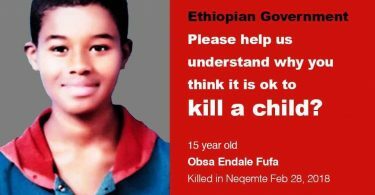 Ethiopia is fast becoming a slow motion killing field. Every single day 10-15 are killed in different regions by snipers and Special Forces under Tigray Front command. These add up. That is why the ruling party resorts to Internet blackouts and tapping phones and emails. News somehow gets out. The good thing is that world community is finally realizing what is going on behind the facade of “war on terror” by a terrorizing regime. That the much touted “peace and development” presents a harsher reality for the populace – especially children and young women (over 2 million are in the Middle East and thousands more fleeing the country every day). Just so we remember, Prime Minister Hailemariam (who never had real power) was pushed out on account of the worsening corruption and repression and as preparation for the state of emergency. The irony is that his deputies and special advisers are still in power. Let me list few names. DebreTsion (deputy pm and in charge of security, telecom, economy, finance, Gerd), Arkebe, Zadig, Berhane, Abay, Seyoum, Sebhat (the latter two without portfolio), Getachew, Seare. Every one of these are Tigray Front members. Don’t take my word for it. Two days after Hailemariam was pushed out, the ruling party issued a statement that “this is not military coup!” The urge for the preemption is bizarre. There was no need for a military takeover, as the country is already divided up under “command posts” with tanks and all. Similar to an occupying force! Command posts are under direct authority of Tigray Front officers. Every key position in the intelligence, security and defense is held by members of Tigray Front. In comparison to other brutal regimes, Ethiopia’s is easy to identify perpetrators for brutalities on civilians when the case is brought before International Criminal Court. In fact, the United Nations two days ago has asked for a probe and prosecution of culprits. I suggest you along with other advocacy groups lodge complaints against VOA, ABC, etc, reports by Tplf plants who consistently twist a story to fit in with Tplf ideology.